AVAILABLE EXCLUSIVELY ONLY AT Supplements Canada! 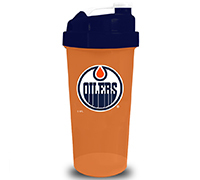 Introducing the Edmonton Oilers NHL Deluxe Shaker Cup! - Officially licensed shaker cup made just for hockey fans, fitness enthusiasts, gym lovers & exercise addicts! This awesome shaker cup is the perfect way for you to support your favorite team & mix your supplements.